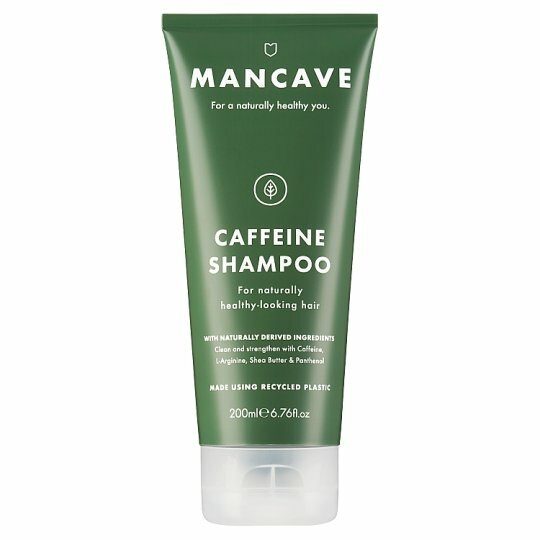 ManCave's daily Caffeine Shampoo is designed specifically for the needs of men. Understanding the importance of virility, the natural formulae gel helps to encourage hair stimulation whilst cleansing and revitalising the hair and scalp leaving roots stronger. Naturally Cleanse and Strengthen your hair with Caffeine L-Arginine, Shea Butter, Panthenol and 8 Essential Oils. This product does not contain; parabens, sulphates (SLS SLES), synthetic dye, petrolatum, mineral oils, ingredients from animal sources and is not tested on animals. Through the forging of Nature and Science, ManCave embarks on a mission replacing the existing generic product offering and owning the bathroom space worldwide. Naturally Derived Grooming Gear formulated especially for men. Free from nasties including parabens, sulphates and petrochemicals. Apply to wet hair, leave to rest, then rinse thoroughly.